STUTTGART, GERMANY — December 18, 2018: Today, GE Power’s Grid Solutions business (NYSE: GE) and the transmission system operator TransnetBW announced that they have signed a contract for a turnkey solution to build the Eichstetten 380 kV substation. Eichstetten is part of a regional area known as “Badische Rheinschiene”, a highly loaded link for the transmission grid in the southwest corner of Germany. TransnetBW’s decision to transition from AIS (air-insulated substation) to GE’s GIS (gas-insulated substation) solution will result in a reduced substation footprint, increased capacity and a reduced environmental impact. Germany’s energy network is in the midst of a transformation. Increasing renewables integration, the move towards decarbonization, sector-coupling initiatives as well as more cross-border electricity flows are transforming the energy landscape today and posing new challenges for Germany’s transmission grid. To support TransnetBW’s priorities to ramp up capacity and decrease substation footprint on their property to allow for future grid management assets, GE’s Grid Solutions team will design, produce, supply and commission 22 bays of 400 kV GIS with associated buildings and control cabinets. GE’s Grid Solutions and TransnetBW agreed on a tight work schedule to precisely plan out the shutdown timeline of relevant assets for the refurbishment work. This contract for a turnkey solution aligns with GE’s commitment to provide scalable power solutions to its customers that support the transformation of their electricity grids. "As a result of Germany’s energy transition, the demands placed on our grid infrastructure are continually increasing. This especially applies to the Badische Rheinschiene connection. The new construction of the Eichstetten substation is an important building block, equipping this connection to address the already existing and increasingly high load flows, which we expect will continue to rise in the future. We chose GE's solution given the complexity of this overall project. Moreover, this grid solution saves us needed space by using a gas-insulated substation – and a reduced footprint is a very important parameter for our construction projects,” said Dr. Werner Götz, Managing Director of TransnetBW GmbH. 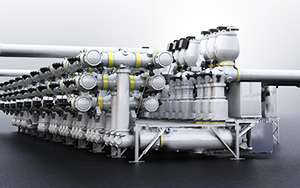 GE Power’s Grid Solutions business provides complete, engineered solutions for high voltage (HV) substations to power generation companies, utilities, and industries, bringing together the right mix of high-voltage products through expert engineering and full project management. GE has designed and implemented over 1,700 substation projects in the last 10 years.